DTR Sports Cars started business in October 1989 and have been restoring, maintaining and selling Italian Classic Cars ever since. Our services have evolved and expanded over the years and we have for some time been carrying out award winning restorations on Ferrari, Alfa Romeo, Lancia and Abarth. Our work has appeared in numerous articles and features including magazine front covers and countless ‘marque specialist’ write ups. Our large workshop in Surrey is conveniently located a few minutes from Junction 7 of the M25 and a couple of hundred metres from Coulsdon South main line station. 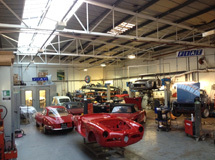 All our offered services are carried out under the same roof which gives us complete control over every aspect of our ongoing projects and means that our customers can physically see every stage of the resurrection of their classic car. We always have an incredibly eclectic mix of cars at various stages of improvement to look at and keep updated photographic records of our ongoing or interesting ‘projects’ on this site, + a weekly blog of what’s ‘in our workshop’. We pride ourselves on every aspect of our work and whether it’s the detailed restoration of a V12 Ferrari, or the routine service of a Fiat Spider, all our cars receive the same attention to detail and the same hourly rate! Bodywork, panel fabrication, engine building and tuning together with upholstery services and routine maintenance are all carried out in-house . We are also a VOSA approved testing station and have computers and software to diagnose and rectify most modern cars too. DTR are one of a very few companies in the UK that can provide such a varied and complete range of services themselves, so if you wish to discuss any aspect (including sales) of your Italian classic car, please contact the team to discuss.